As you can see here, getuping seriously stylish doesn't require that much effort. 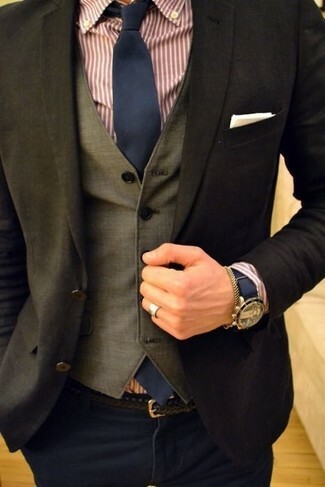 Just consider wearing a black blazer and navy chinos and you'll look nice. 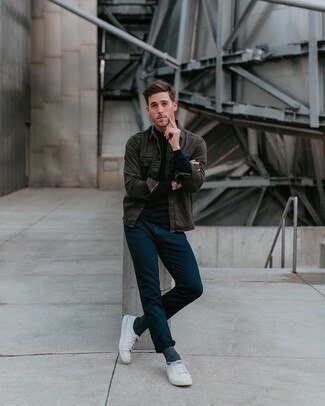 This combination of a blue blazer and Mennace Trousers In Navy With is super easy to throw together without a second thought, helping you look stylish and ready for anything without spending too much time searching through your closet. 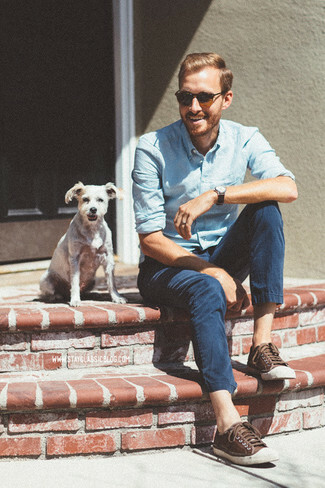 If you're on the lookout for a casual yet sharp look, make a light blue chambray long sleeve shirt and Mennace navy chinos your outfit choice. 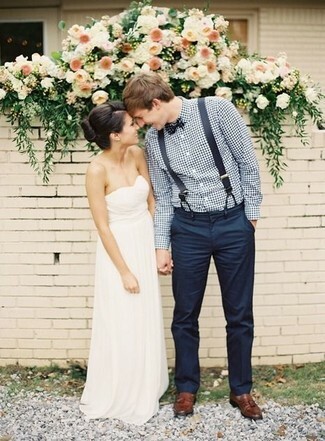 As well as totally comfortable, these pieces look great when worn together. Break up your look with more casual footwear, such as this pair of dark brown leather low top sneakers. If you're on the hunt for a casual yet stylish ensemble, marry a navy crew-neck t-shirt with Mennace Trousers In Navy With. Both garments are very comfy and they will also look stunning paired together. When it comes to footwear, this look pairs wonderfully with white low top sneakers. 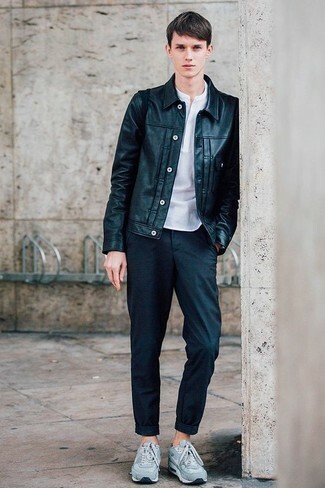 For dapper style without the need to sacrifice on functionality, we love this combination of a dark green leather bomber jacket and Mennace Trousers In Navy With. Grab a pair of light blue athletic shoes for a more relaxed feel. 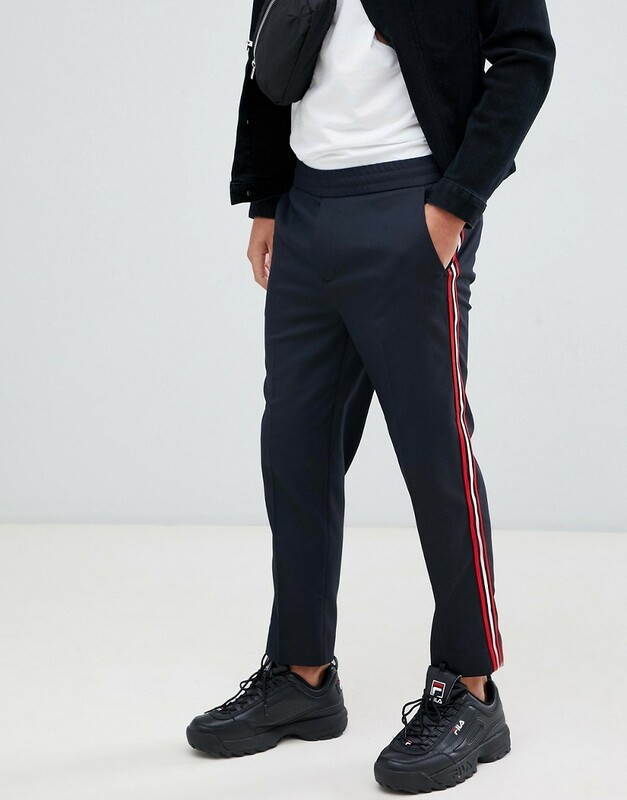 A navy crew-neck sweater and Mennace Trousers In Navy With from Asos are the kind of a fail-safe casual outfit that you need when you have zero time to spare. And if you want to effortlesslly dial down this look with one item, complement your look with white canvas low top sneakers. If you're on the hunt for a casual yet on-trend ensemble, dress in a white and navy vertical striped long sleeve shirt and Mennace Trousers In Navy With. These two items are super comfortable and they also look great when paired together. You could perhaps get a little creative when it comes to footwear and elevate your ensemble with tobacco leather oxford shoes. For a smart casual getup, marry a white and navy gingham dress shirt with Mennace Trousers In Navy With — these items play really well together. 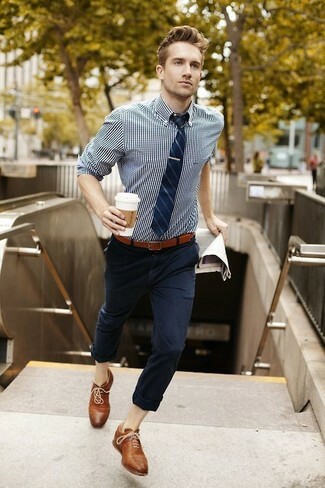 Wearing a pair of brown leather tassel loafers is a simple way to add some flair to your getup. If you enjoy a more casual approach to dressing up, why not try teaming a blue polo with Mennace trousers in navy with from Asos? Round off with white leather low top sneakers and off you go looking dashing.